The Ivy Tower Bridge and Thames Rockets Experience For Thrill Seeking Foodies! For thrill seeking foodies everywhere – here is an experience not to be missed! You can now enjoy a thirst quenching gin and tonic on arrival at the luxurious Ivy Tower Bridge, followed by three course lunch and speed boat experience with Thames Rockets for just £62pp. The package deal is available now and offers outstanding value at one of London’s most famous restaurant chains, which can now be enjoyed alongside the ultimate sight seeing tour of London. Whether you’re a local, or a Londoner, Luxuria Lifestyle can guarantee you won’t be disappointed by the ultimate lunch or evening out with friends or family combined with a novel way to see London as you’ve never seen it before. With limited availability this summer (Friday’s only, until 31st August), be sure to book in advance for a table at the Ivy Tower Bridge’s super stylish brasserie overlooking the river, you’ll be blown away by the interiors which have been designed by Scandi design studio Martin Brudnizki. With a Parisian chic meets art-deco vibe and floor to ceiling glass to make the most of those gorgeous views, you’ll get to enjoy a gin & tonic to start while you peruse the special menu curated by Exec Chef Sean Burbidge. Choose from starters like the seasonal pumpkin soup, crab served on watermelon with avocado, or shredded mustard beef, followed by mains like wild mushrooms on brioche, roasted chicken breast, roast salmon, or chargrilled minute steak, with a range of sides like the infamous parmesan and truffle fries, and finishing with a choice of delicious desserts. 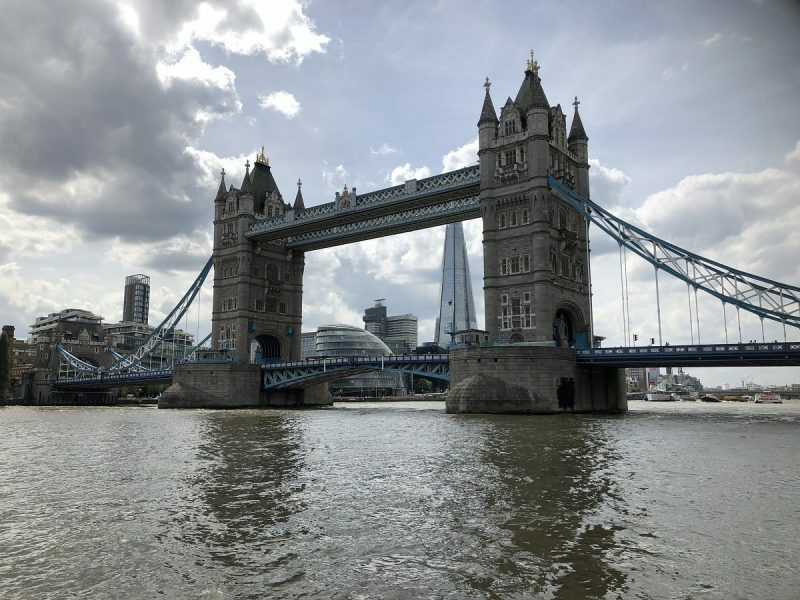 After lunch, stretch your legs and take the short walk over Tower Bridge to St. Catherine’s Dock, where you’ll be greeted by the team, briefed on safety and given a life jacket, before you board one of the Thames Rockets’ boats. As Tower Bridge disappears in the distance, the speed picks up and the tunes kick in! It’s a truly exhiliarating experience and not one for the faint hearted, although the very capable crew (Andy was our skipperand Omar our very funny tour guide), will tone it down or speed it up depending on your preference. 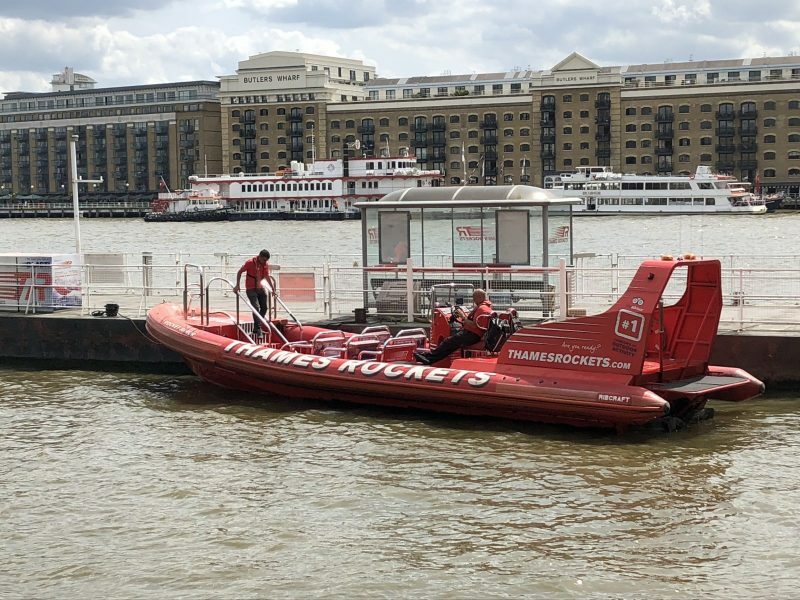 We wanted to go full throttle and so got up to speeds of around 30 knots (35 mph) while the Thames Rocket literally rockets up the river, twisting and turning as it goes. The fast and furious journey will take you from down to Greenwich, past the O2 and up to the Thames Barrier where you’ll stop to catch you breath before bombing it back.